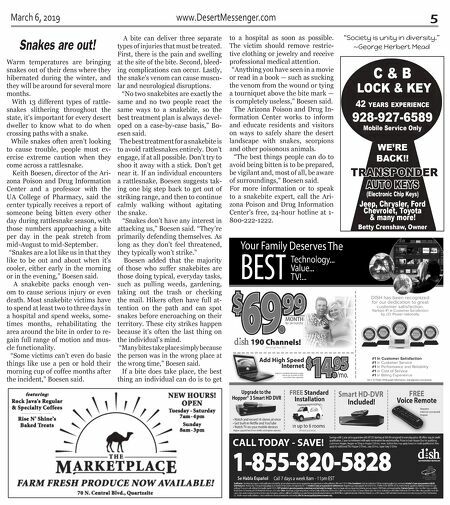 4 www.DesertMessenger.com March 6, 2019 Read Desert MESSENGER ONLINE @ www.MyQuartzsite.com DO YOU HAVE EXPIRED OR UNUSED MEDICATIONS? DUMP THE DRUGS at QPD! Dispose safely at QUARTZSITE POLICE DEPT. Mon - Fri. 8am-5pm 305 N. Plymouth, Quartzsite 928-927-4644 Space donated by Desert Messenger 410 E. Main St. Quartzsite, AZ 928-927-9300 CUSTOM FRESH CUT QUALITY MEATS! Produce • Bakery • Deli • Fresh Breads DONUTS DAILY! Custom Designed CAKES! JOIN US FOR OUR COOKOUT! Thursday, March 14 @ noon! BRATWURST, Sauerkraut, Chips, & Soda, $ 5.99 RIB EYE STEAK SANDWICH, Chips, & a Soda, $7.99 LUNCH SPECIALS! 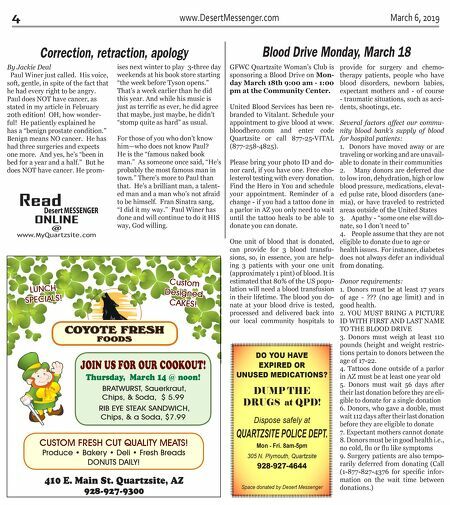 COYOTE FRESH FOODS Blood Drive Monday, March 18 GFWC Quartzsite Woman's Club is sponsoring a Blood Drive on Mon- day March 18th 9:00 am - 1:00 pm at the Community Center. United Blood Services has been re- branded to Vitalant. Schedule your appointment to give blood at www. bloodhero.com and enter code Quartzsite or call 877-25-VITAL (877-258-4825). Please bring your photo ID and do- nor card, if you have one. Free cho- lesterol testing with every donation. Find the Hero in You and schedule your appointment. Reminder of a change - if you had a tattoo done in a parlor in AZ you only need to wait until the tattoo heals to be able to donate you can donate. One unit of blood that is donated, can provide for 3 blood transfu- sions, so, in essence, you are help- ing 3 patients with your one unit (approximately 1 pint) of blood. It is estimated that 80% of the US popu- lation will need a blood transfusion in their lifetime. The blood you do- nate at your blood drive is tested, processed and delivered back into our local community hospitals to provide for surgery and chemo- therapy patients, people who have blood disorders, newborn babies, expectant mothers and - of course - traumatic situations, such as acci- dents, shootings, etc. Several factors affect our commu- nity blood bank's supply of blood for hospital patients: 1. Donors have moved away or are traveling or working and are unavail- able to donate in their communities 2. Many donors are deferred due to low iron, dehydration, high or low blood pressure, medications, elevat- ed pulse rate, blood disorders (ane- mia), or have traveled to restricted areas outside of the United States 3. Apathy - "some one else will do- nate, so I don't need to" 4. People assume that they are not eligible to donate due to age or health issues. For instance, diabetes does not always defer an individual from donating. Donor requirements: 1. Donors must be at least 17 years of age - ??? (no age limit) and in good health. 2. YOU MUST BRING A PICTURE ID WITH FIRST AND LAST NAME TO THE BLOOD DRIVE 3. Donors must weigh at least 110 pounds (height and weight restric- tions pertain to donors between the age of 17-22. 4. Tattoos done outside of a parlor in AZ must be at least one year old 5. Donors must wait 56 days after their last donation before they are eli- gible to donate for a single donation 6. Donors, who gave a double, must wait 112 days after their last donation before they are eligible to donate 7. Expectant mothers cannot donate 8. Donors must be in good health i.e., no cold, fl u or fl u like symptoms 9. Surgery patients are also tempo- rarily deferred from donating (Call (1-877-827-4376 for specifi c infor- mation on the wait time between donations.) By Jackie Deal Paul Winer just called. His voice, soft, gentle, in spite of the fact that he had every right to be angry. Paul does NOT have cancer, as stated in my article in February 20th edition! OH, how wonder- ful! He patiently explained he has a "benign prostate condition." Benign means NO cancer. He has had three surgeries and expects one more. And yes, he's "been in bed for a year and a half." But he does NOT have cancer. He prom- Correction, retraction, apology ises next winter to play 3-three day weekends at his book store starting "the week before Tyson opens." That's a week earlier than he did this year. And while his music is just as terrifi c as ever, he did agree that maybe, just maybe, he didn't "stomp quite as hard" as usual. For those of you who don't know him—who does not know Paul? He is the "famous naked book man." As someone once said, "He's probably the most famous man in town." There's more to Paul than that. He's a brilliant man, a talent- ed man and a man who's not afraid to be himself. Fran Sinatra sang, "I did it my way." Paul Winer has done and will continue to do it HIS way, God willing.